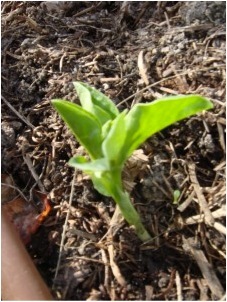 Young Broad Bean plant just emerging. April to June is the best time to plant Broad Beans in Melbourne. Sow your seeds 5cm deep, 15cm apart with the rows about 60cm apart. Plant at least 2 rows to help with pollination. Water the seeds in but don’t water again until the young plants start to appear. Broad beans need to be staked, they grow quite tall and the plants get really heavy when the bean pods are maturing. Make sure you keep tying them as they grow or the plant will snap under the weight of all the yummy beans. What’s your favorite Broad Bean recipe? Young Garlic planted April 2012 by Yummy Gardens, Melbourne. Autumn is the time to plant garlic in Melbourne as it is a day-length sensitive crop. Australia consumes approx 3500 tonnes of fresh garlic every year and much of it is imported. Our quarantine laws demand that imported garlic is treated in order to kill any biological or fungal threats to our farming industry. This means it has to be treated with powerful, often toxic, chemicals, such as methyl bromide, that attack the nervous system. Eating fresh garlic improves heart health. It lowers bad cholesterol in the bloodstream, reduces high blood pressure and combats infection. Garlic prefers a rich well drained soil that has been well dug over with no hard lumps to inhibit growth. We find that our raised beds filled/topped up with some fresh organic veggie mix soil works really great for growing garlic. We just break up some garlic heads that we have saved from the previous season (the nice fattest ones) into individual cloves and push then in pointy end up about 5cm deep and 10cm apart. You should be able to plant about 50 cloves in a square metre. Keep your garlic bed weed free. 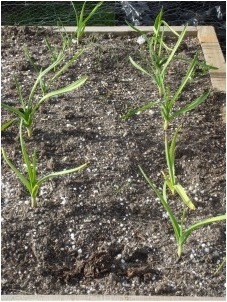 We like to give the young garlic an occasional water with seaweed solution once the leaves appear. As the plants get close to harvesting make sure you do not over water them as over-moist soil can lead to rotting bulbs. Harvest them when the tops start to yellow and there is only 4 or 5 green leaves left. Spread or hang your garlic in a cool, dry spot to cure. Mmmmm – Fresh garlic – Absolutely Yummy. Have you had any garlic growing adventures?